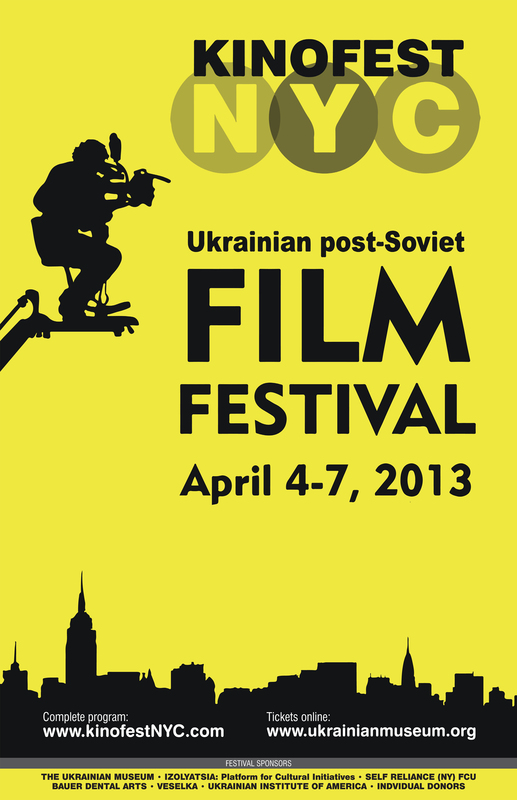 New York City, March 28, 2013 — Kinofest NYC, featuring independent film from Ukraine and the broader post-Soviet region,has announced the upcoming program for its fourth annual festival which will take place April 4–7, 2013. This year, the festival includes ten screening sessions presenting more than thirty short and four feature films by independent filmmakers from Ukraine, Azerbaijan, Belarus, Estonia, Russia, Slovenia, the United Kingdom, and the United States. Twelve filmmakers are flying in from Ukraine and Estonia to present their films. Kinofest NYC 2013 will take place in three different locations around New York City. The festival weekend will kick off on Thursday, April 4, with opening night at The Ukrainian Institute of America (2 E.79th St.); all other film screenings are scheduled at The Ukrainian Museum (222 E.6th St.) and the Anthology Film Archives (32 Second Ave.), two longstanding East Village cultural institutions. The complete program, with information about each film and links to trailers, is posted on KinofestNYC.com. The popular "Goodbye, Ukraine!" short film series is returning to Kinofest NYC, this year showing seven new shorts that will have their U.S. premiere at the festival. In 2012, the "Goodbye, Ukraine!" group of filmmakers completed an anthology of 34 short films with recurrent themes: how and why Ukrainians choose to leave their country since its independence from the Soviet Union in 1991, and unique observations of those who stayed behind and how they cope with life in contemporary Ukraine. Denis Ivanov, executive director of "Goodbye, Ukraine!" and director of the Odesa International Film Festival, is flying in to present the short film series. Five of the "Goodbye, Ukraine!" filmmakers will also be on hand at the opening night event. One of the highlights of the festival is the New York premiere of Pit No. 8, a human-interest documentary by Estonian filmmaker Marianna Kaat. The film follows a teenager's journey from a dysfunctional household to an illegally operated coal mine near his hometown, where he scrapes by, providing for himself and his siblings. The director of the award-winning film will present her film, along with Alla Tyutyunnyk, a director of the International Human Rights Documentary Film Festival DOCUDAYS UA in Ukraine, where this film was shown in 2012. Making its U.S. premiere at this year's Kinofest NYC is the dark comedy Business As Usual by husband-and-wife team Valentyn Vasyanovch and Iya Myslytska. The story is about a Ukrainian doctor going through a mid-life crisis, which leads him on a journey of comical self-discovery, causing him to lose his status-minded wife and get involved in several hare-brained schemes with a close friend. Tickets to Kinofest NYC 2013 are $12 per screening, and are available online. Opening night at the Ukrainian Institute is $15 at the door. All films shown are in English or their original language with English subtitles. Kinofest NYC is produced in cooperation with The Ukrainian Museum as part of its program "Film in Perspective" (the Museum’s film program is supported, in part, by public funds from the New York City Department of Cultural Affairs in partnership with the City Council). Other major sponsors of the festival include Self Reliance (NY) Federal Credit Union, Bauer Dental Arts (NYC), and Izolyatsia- Platform for Cultural Initiatives (Ukraine), the Ukrainian Institute of America (NYC), and individual contributors. KinofestNYC.com was founded in 2009 by a group of East Village residents with a passion for cinema, and a desire to advocate Ukrainian independent film. The festival seeks to educate and entertain its viewers, and to provide opportunities in the U.S. for the new generation of innovative and talented filmmakers from that part of the world.